So I have made a lot of progress in the past week, but like everything these days, it just doesn't seem like as much as the early days. 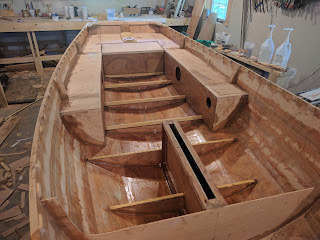 I started off by getting the aft compartment painted with 2 coats of primer on all surfaces to before epoxying the rear deck in place. I know final paint will wait, but doing the priming now should make things easier down the line. 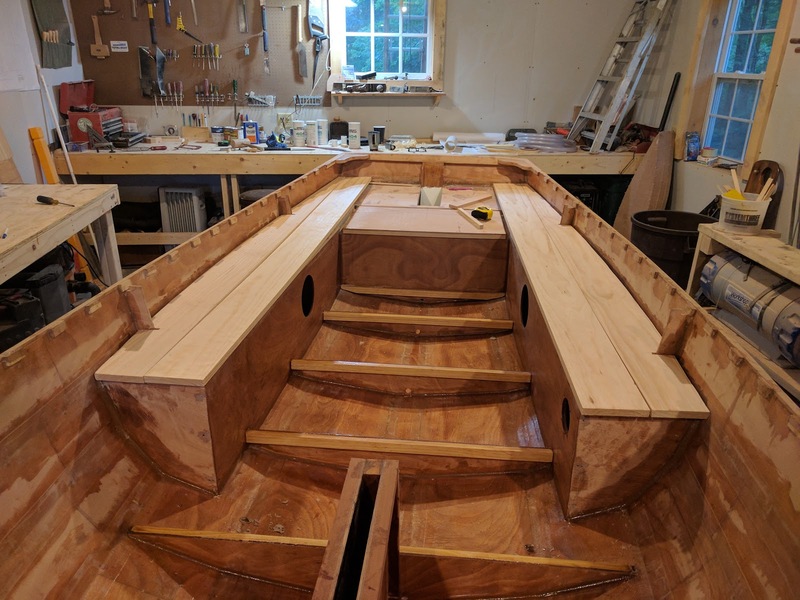 After I got the smell out of the shop when the second coat was finally dry, I glued down the rear deck and seat tank tops and held them in place with screws while the epoxy kicked. 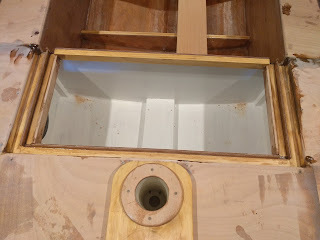 Fast forward a day and I took the router with a roundover bit and trimmed off the edges of the seat tanks and did the same around the hatch coaming channel. Next up, I sanded down the entire interior below the seat tanks and rolled on a coat of unthickened epoxy. Overall I spent about 3 hours sanding and because there were so many tight corners, the vast majority of it was done with little pieces by hand. In fact, I sanded so much with my fingertips that my fingerprint reader on my phone and computer stopped working for several days. I literally sanded off my fingerprints. Once the coat of epoxy was mostly dry (the next day), I fitted floor stringers (probably the wrong word here) to the frames that will be used to accept fasteners from the floorboards and help stiffen the plywood frames. I epoxied them in place with thickened epoxy and then painted on a coat of unthickened epoxy to seal them up. I spent some time cleaning up and sanding the seat tops and rear deck and that's when I found the screw up. I have been planning on doing pine planks on top of the seat tanks, rear decks, and seat compartment but as I visualized how I would do it so it would look good, I realized I had made the rear compartment hatch and opening too wide to accommodate the pine planks running fore and aft without cutting out part of them. So after several days of thinking about whether to just get on with it or fix it so it doesn't bug me, I came up with a plan to fix it that wouldn't take too long and would allow me to decrease the width of the compartment. In a nutshell, I cut out a notch in the front and rear of each side of the compartment coaming and glued in another channel. At the same time, I decreased the width of the compartment hatch by cutting off the ends and glued in 2 new pieces for ends. 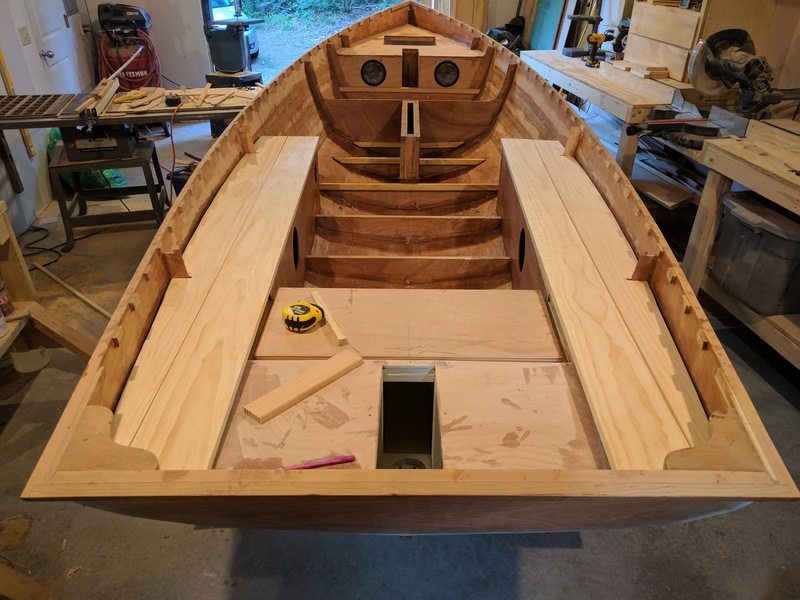 I lost about a day's work, but in the end it will look better once the pine planks are in place and run fully fore and aft without any cutouts that disrupt the visual flow. A side benefit is that the channel will drain water better and keep it out of the compartment. Finally, I found some nice clear pine planks that will make good seat tops and had just enough time this afternoon to rough cut them out. They will have to be bent in place, but I was able to easily push them into place to accept the curve of the seats as they move aft. 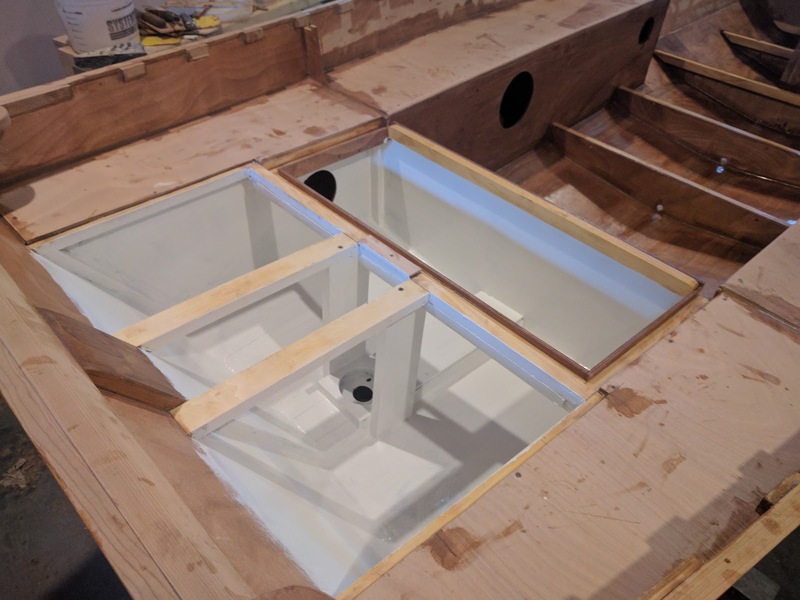 What I need to do first though is to epoxy plywood risers on top of the rear deck, seat tanks, and hatch. These will allow the planks to have a little space underneath them to drain water, but I'm not 100% sure that I will do that. I won't be able to work on the boat for the next few days so I'll have some time to mull it over.